Just to be clear, I am a fan of the mighty mushroom, and one of my favorite ways to eat a mushroom, is stuffed! There are so many choices for stuffed mushrooms, from crab to hamburger, but my absolute favorite are the famous Sausage Stuffed Mushrooms that my mother has made every year since I was a kid. Let me tell you guys, these things really are famous and are begged for whenever we go visit back home. When I make them at family gatherings, I don’t think there have every been any left. 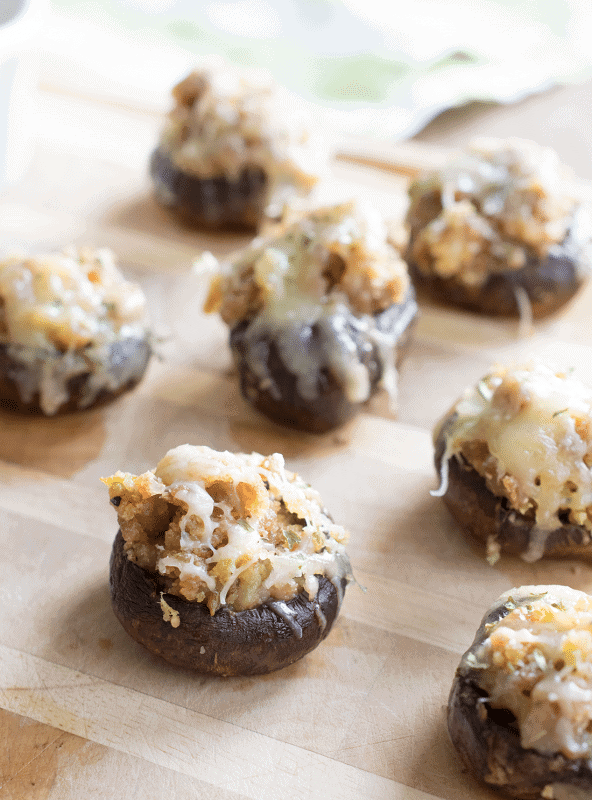 You guys have to try these Italian sausage stuffed mushrooms… you will love them!! One thing about my mother’s recipes is that she is always experimenting, so I can’t say that she has ever made them the same way twice. However, they have always been amazing and today I am sharing the basic recipe, but this recipe is so forgiving that changing or adding something works almost every time. For instance, my mom usually used Italian Breadcrumbs and Italian Sausage, but I find it to be a little overpowering for me personally, so I just use plain breadcrumbs and really good italian sausage. They are a treat we look forward to every time we visit and especially for holiday gatherings – because it’s a guarantee at this house that they are on the menu. I actually even love them with other fillings at resturants, but you get so few for sharing. I was at Olive Garden recently and noticed they are offered on the sampler, but you get so few. What is up with that? I could eat them all myself. Good thing they aren’t particularly hard to make! The most tedious process of making stuffed mushrooms is cleaning the caps out. Start by pulling the center stems out by rocking them gently to break away from the cap. You should hear a snap and they pull out easily. Then I wash the mushrooms and any saved stems. You do not need to peel the outside of the cap, but do make sure to get any dirt off. Using a small spoon, I core out the center a bit to make room for more stuffing. It’s not necessary but I scrape a bit of the inner gills and that thin flap that covers the edge of the mushroom cap. As you can see in the photo above, it does not have to be perfect at all. You can use button mushrooms, baby bella, or even larger portabella mushrooms for this recipe. If you want more mushroom flavor, save the stems and chop in a food processor with the onions and celery. I save about half of the stems for this recipe but feel free to adjust as you like. This is also a good cost saver. Making stuffed mushrooms properly is all about the ratio of stuffing to mushroom. I find that equal parts usually works best. I think my favorite part though is the melted Swiss cheese over top to finish off these little delights. Devour. Simple and poppable, thank you little mr. mushroom! Are you a fan of stuffed mushrooms too? Perfect for a party or as a side item, these Sausage Stuffed Mushrooms are a must try! They are flavorful, cheesy, and easy to make! Clean and core the mushrooms. Save about half of the stems and very finely chop in a food processor or with a knife. Take a spoon and clean out the center of the mushroom caps to create more room for stuffing. Does not need to be perfect or remove all the gills. Preheat Oven to 350 F. Place mushrooms stem side down on a baking sheet and bake for 20 minutes or until liquid releases from the mushrooms. While the mushrooms are baking, prepare the stuffing. In a skillet over medium heat, crumble the Italian sausage and cook until no longer pink. Move the Italian sausage to a plate but do not clean the pan. Add the minced garlic, basil, onion, celery, and reserved mushroom stems. Cook until soft and the onions are translucent. Remove from heat and stir in the sausage and Parmesan cheese. Stir in the breadcrumbs a little at a time to avoid using too much. The stuffing should look well coated and course, but not overly dry. If the stuffing looks too dry, you can add a bit of chicken broth to moisten it. With a spoon, pack the mushroom tops with the stuffing. Bake for 10 minutes. Remove from the oven. Top with shredded swiss cheese and put in a warm oven for a few minutes to melt. The stuffing consistency should not be too crumbly or it may make them harder to stay together in the mushroom. You can tell this by how well it sticks together if you form a ball in your hand. While it shouldn't be too wet, if shouldn't crumble in your hand. Adjust the bread crumbs and cheese if necessary. If too dry, add a bit of chicken broth or stock. Thanks for the recipe Rachel! I have always loved these. Best stuffed mushrooms I have ever had!